I promised last month to keep the introductions to the favorite posts very short, so let’s get started. No fluff today! The following list includes the “things” that I particularly loved in March–some are new to me and others are just regular favorites that we haven’t talked about. 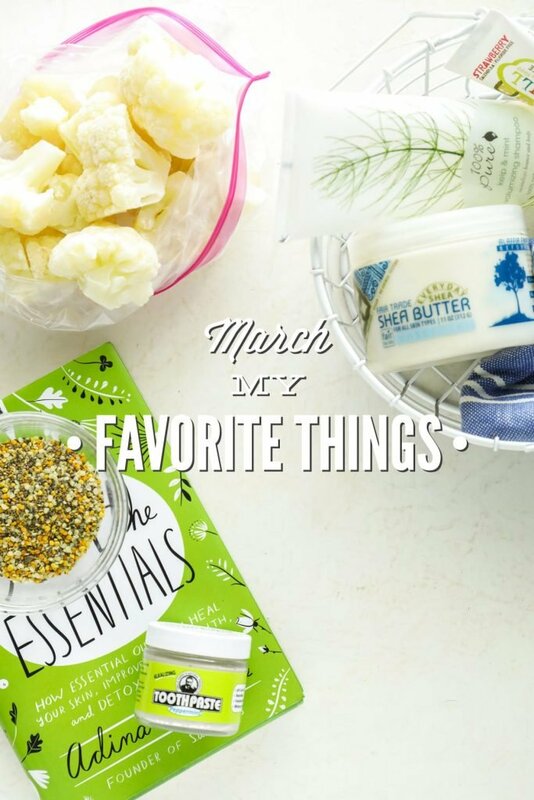 If you missed February’s favorite things (which are still my favorite ;)), you can check out my list over here. I’ll go first, and then I’d love to hear from you in the comment section below. I pre-ordered this book a few months ago, and it just recently arrived. I’ve been waiting for an easy-to-read book on essential oils that’s both practical and educational, and this book is it! 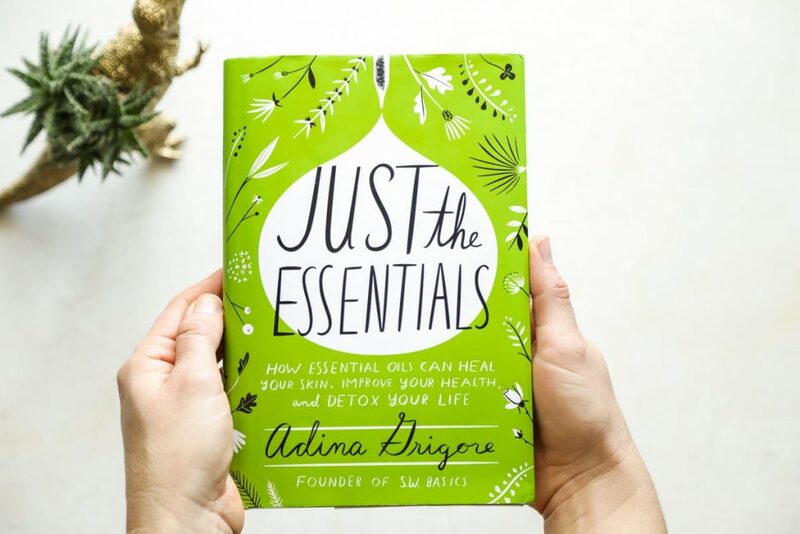 I love Adina’s writing style, her unbiased take on essential oils (*cough cough*, she’s brand neutral), and her safety-first approach. 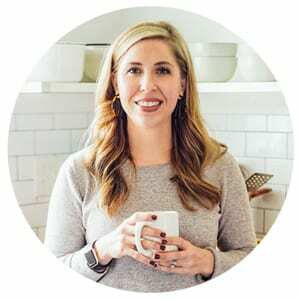 I don’t think her recipes are simple since some use essential oils I’ll probably never purchase, but the information she presents is incredibly helpful if you’re new to essential oils or just trying to better understand them. We discovered this documentary on Netflix just a couple of weeks ago. 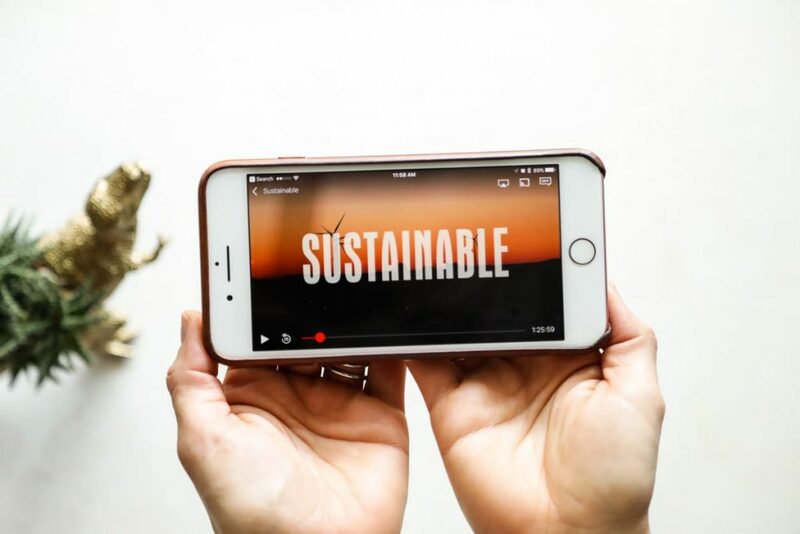 It’s such a well-balanced and practical look at real food in 2017–touching on everything from the importance of sustainable farming, to ancient grains (like einkorn and spelt) and pasture-raised animals. The documentary is available on Amazon and Netflix. It’s a must-watch film for anyone concerned about our current food system. 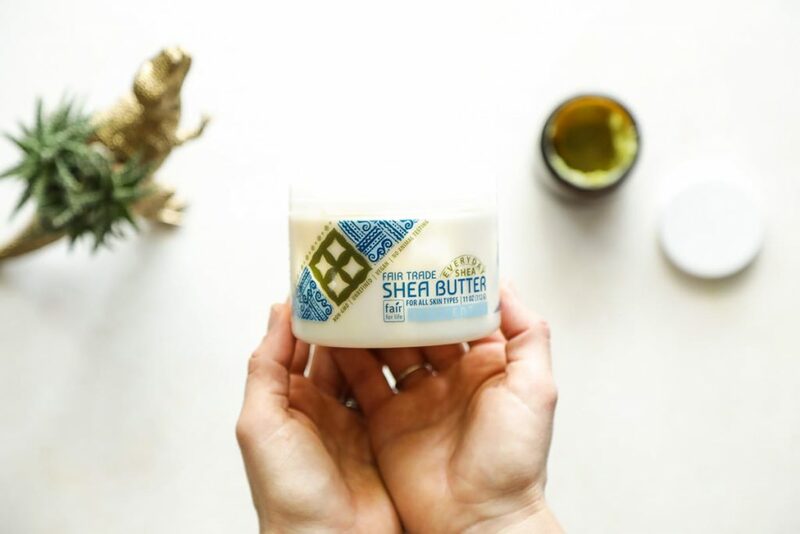 I forgot how much I love using shea butter on my face, until a few weeks ago, when a cold front passed through Florida. The cold front was accompanied by chilly temperatures and dry air–something my humidity-loving skin doesn’t care for one bit. That week, I whipped up a simple combo of shea butter (intense moisture) and Plant Therapy’s Clear Complex Carrier Oil (this made my favorite list last month). My skin has been loving this combo. And despite the humidity returning, I’m still using this moisturizer at night before bed. 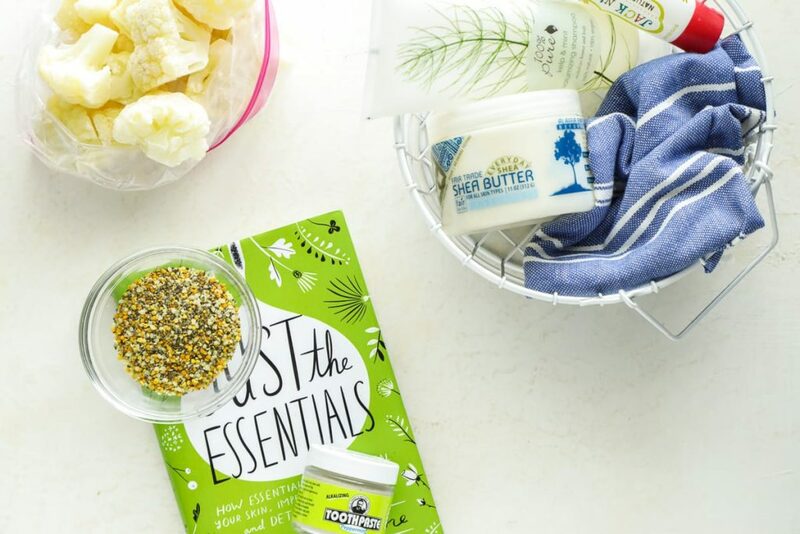 I love that natural skincare is so easy to customize based on my skin’s current need. I’ve tried natural shampoos with either okay (it works) or absolutely terrible (let’s just fry an egg on my head) results. 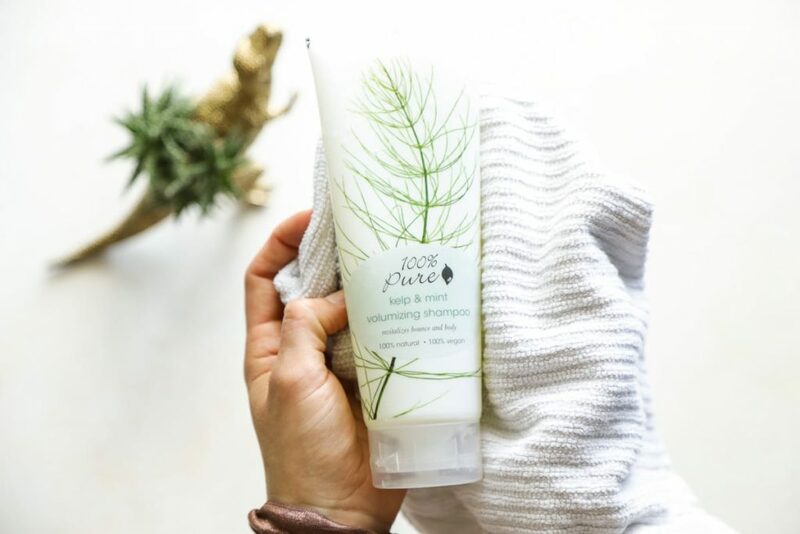 After falling in love 100% Pure’s makeup (also featured on February’s list) , I decided to try a 100% Pure shampoo. Hands down, this is the best natural shampoo I’ve tried. It doesn’t dry out my hair or leave it feeling greasy. At the moment, I’m not using conditioner. Unlike shampoo, I’ve tried and enjoyed quite a few natural toothpaste options over the years, even homemade toothpaste. Right now, I’m enjoying Uncle Harry’s Toothpaste. I love the flavor, which comes from essential oils. 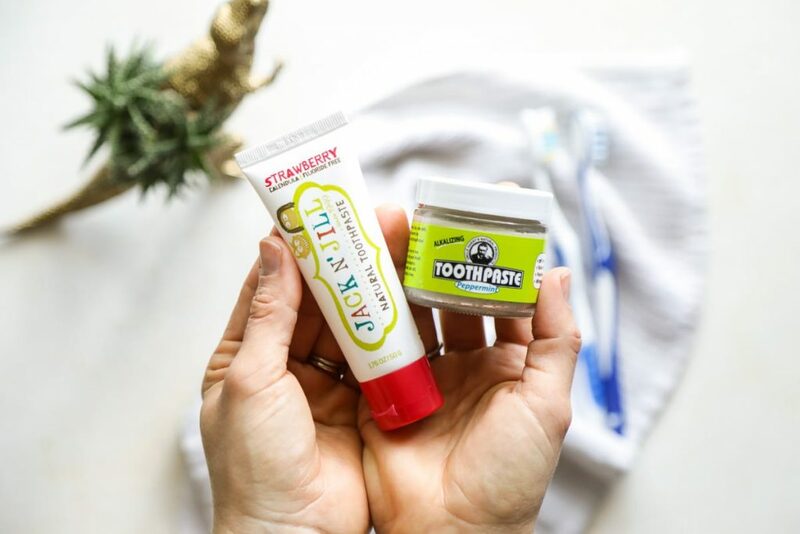 I’m not a huge fan of scooping the toothpaste from the jar, but I’ve learned to embrace this method when it comes to some natural toothpaste options. The kids are using a new-to-us toothpaste these days called, Jack N’ Jill. This toothpaste comes from Australia (I purchased a set of three on Amazon). It’s made with good ingredients and the kids like the strawberry flavor. We’ve been purchasing our meat from a local farm, Trailbale Farm, via their CSA program (Community Supported Agriculture). Four times a year, I write a check for meat and eggs, and then pick up a portion of this order twice a month at a drop-off location. We also decided to join a produce farm’s CSA program, Little Pond Farm, for the 2017-2018 growing season. 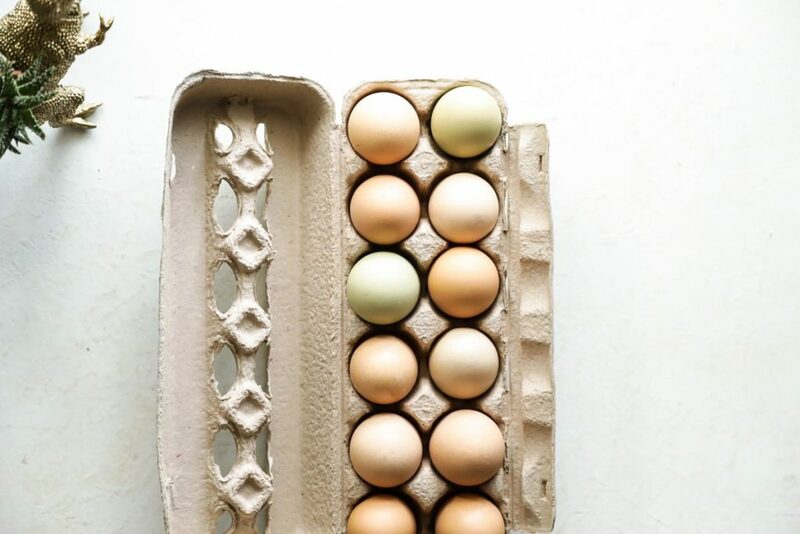 We’ll be picking up our produce box every two weeks, just like our meat and egg order, starting in October 2017. A CSA program is such an incredible way to support and love on local farms. 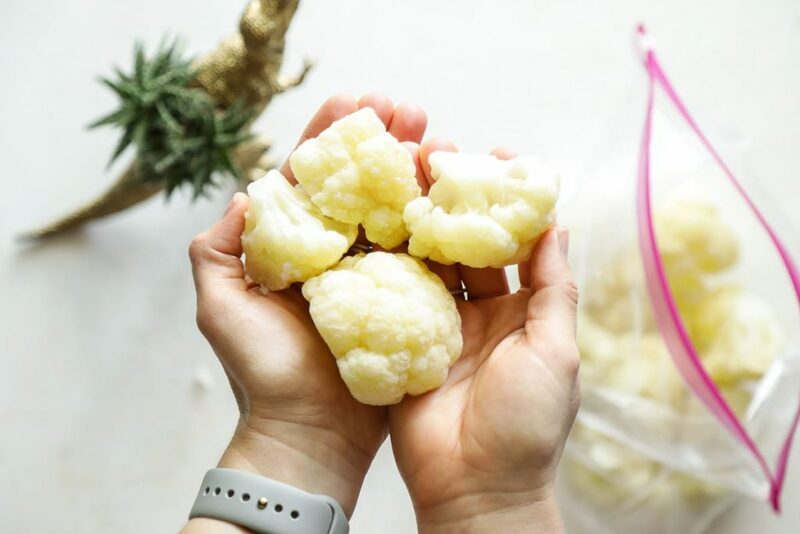 Chop a head of cauliflower into smaller florets, and then steam the florets for just a few minutes, until they soften. Place the softened florets on a baking sheet and freeze. Once frozen, place the florets in a freezer-safe bag or container. I usually add two florets to our smoothies before blending. 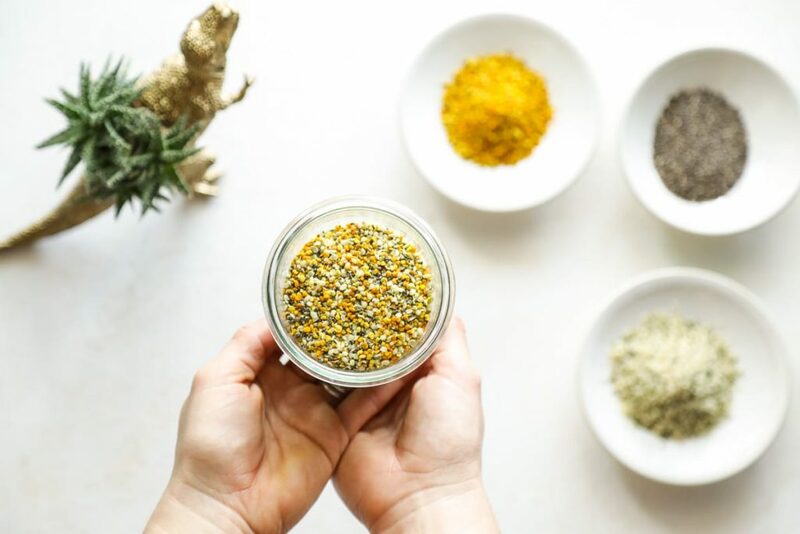 In a storage jar, combine equal parts (I do 1/4 cup each) bee pollen, hemp seeds, and chia seeds. If you don’t want to use bee pollen, or any other recommendation, then try subbing the ingredient with flax seeds. Place a lid on the jar and shake to combine the ingredients. I keep my jar in the fridge. I add 1 tablespoon of the mix to our smoothies (my smoothie creations generally feed 2-3 people, so I reduce this amount for an individual smoothie). I joined Pure Barre almost one year ago. It’s changed my body (hello, baby abs and toned-up arms), improved my energy, and allowed me to connect with amazing women. I try to workout four times a week. When I’m not able to make it to the studio, I need a good workout that can be done at home. I discovered Sara Fit on YouTube last month, and I’m absolutely loving her easy-to-follow workout videos. She’s a mom, so her workouts are designed for busy women who need something that’s effective and quick. 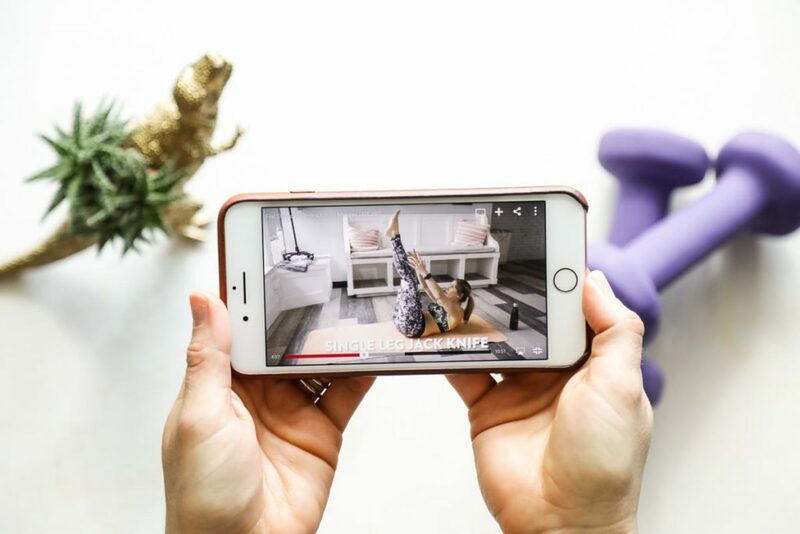 I’ve found that her Flat Stomach Workout in 10 Minutes and 10 minute Arm Workout For Women With Weights are great supplement workouts on days when I can’t make it to Pure Barre. Okay, enough about my favorite things. Now it’s time for you to chime in. I would love to hear from you via a comment below, and I know the rest of the Live Simply Family would love this as well. Share anything you’re particularly loving right now: a recipe/DIY project, a book, a routine, a park, a brand, a store/market, an apron, a shirt. Anything! I visit your page as much as I can, and every time I do, I am so happy!!! Thanks for sharing your favourites with us. My favourite is so simple… LINEN!! Linen towels, to be precise. I have long stopped using the terry cloth towels as they just don’t work for me anymore; they are too bulky, take a lot of room in the wash and take forever to dry (I try to avoid using my dryer and dry my clothes naturally) – I live in Canada and it only seemed practical to look for something more ‘user friendly’ ! I would recommend them to everyone – if not linen then Portuguese sauna towels! They are awesome and are available in HomeSense/Winners in Canada! Hey Mihela, Thank you so much, I’m so glad you’re enjoying the blog! And thank you for sharing about linen towels. I have a few linen napkins that I adore, but haven’t tried linen towels before, or even heard of this option. Now I’m curious…I’m going to look into some. Thank you for sharing! I had a question regarding the tooth paste that you recommended. I have been looking for a natural toothpaste that actually cleans my teeth well. I have heard a lot about the toothpaste located in a jar. I was wondering if I place my tooth brush in their and scrape the top, will I be creating bacteria every time that I do that? I know the tooth brush can hold bacteria. I was hoping that you could help clear this question up for me. I have been concerned about bacteria build up! Thank you so much for your blogs. I look forward to getting the emails and reading your advice. I strive to have a healthy family. Have a great day! Hey Bri, Thank you, I’m so glad you’re enjoying the blog! This was a concern for me, too. I’ve used a mini spoon in the past with other from-the-jar toothpaste options, including homemade toothpaste. This particular toothpaste includes a statement on the jar about this exact method: “Yes, it’s okay to drip your brush directly into the jar! The essential oils in this toothpaste are incredibly antiseptic.” I also like Nature’s Gate and Redmond Clay brands–both options are tubes versus jars. So why are you hooked on the cauliflower in smoothies? Does it make it smoother? Also, can you taste the cauliflower at all? Thanks, I’ve never heard of this! Hey Holly, I love that it’s such an easy to add a veggie that we don’t often consume. It’s so easy to grab a few florets from the freezer and start the day with some veggies (in a smoothie). I don’t think you can taste it–as long as you don’t add too much. My family hasn’t noticed yet, so I’m guessing they can’t taste the florets either. I don’t add the cauliflower to every smoothie, but it’s nice to have the veggie option. Just one more way to pack the smoothie with good nutrients. I know we’re into April already, but my favorite thing from March is the new Aldi that opened near us! We are still transitioning from the typical American diet to whole foods, and I don’t have time to meal plan and go to farmers market as often as I would like. Aldi has lots of organic produce, and other organic items like quinoa and canned beans at great prices! Saves me time and money and helps me fees my family well. Love it! That’s awesome, Sarah! I keep hearing so many great things about ALDI. I haven’t visited one since we did the shopping series and, at that time, they were just starting to really carry real food ingredients (other than produce). I’ll have to check them out again–thank you for sharing. I am loving homemade peanut butter. Whether I grind it at the store or at home with my Ninja I use bulk roasted peanuts so they are fresh and then I add salt and honey to taste. I love being able to control what kind of peanut butter I get, no more staring at label after label, or wondering what smooth, chunky, or extra crunchy, less salt or low fat tastes like. I also love just making enough to last a month or two so it always tastes fresh. Another new love is rose water sprayed on as toner for my face and freshener for my hair. The last thing I’ve been enjoying is Red Raspberry Seed Oil as a head to toe moisturizer and a bit of natural SPF when I get out of the shower. I love these posts I’m looking forward to checking out the workouts! So many great things, Bethany! I know what you mean about staring at label after label, lol. Who knew buying peanut butter could be so complicated, especially when you see how easy it is to make. I’ve never thought of using rose water as a hair freshener–great idea. I’ve heard great things about red raspberry seed oil, but I’ve never actually tried it–I may have to pick up a bottle. So many great things! I’ve been looking for a new toothpaste – will have to try this one. And the shampoo….My hair is so fine it’s difficult to use clean shampoos. I use sulfate-free but haven’t fully committed to anything else yet.